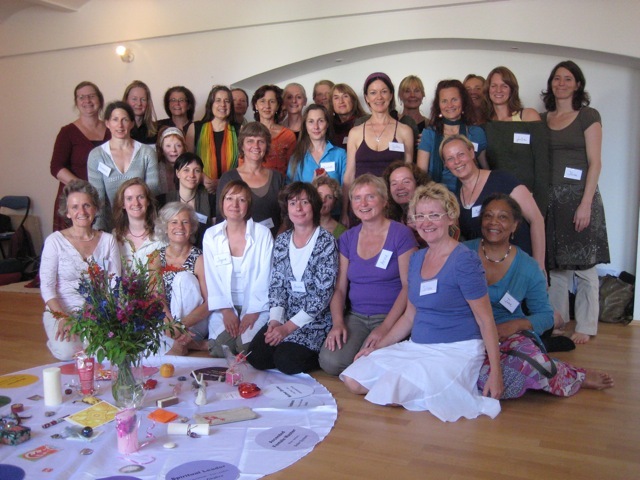 In the past, Lucia gave workshops in the US, Canada, and Europe, entitled Women Standing in Their Power and Embracing the Divine Feminine, where she worked with women and men to explore the Divine Feminine energies in a practical, hands-on way. Two of these workshops were videotaped. Her Women Standing in Their Power DVD combines the best footage from both, as well as additional instructional segments. The 2-DVD set runs almost 3 hours, but with discussion points, the total working time is 4 hours. In the DVD, Lucia enumerates the 12 female archetypes handed down from the Matrilineal Era that were fractured, polarized, and corrupted during the Patriarchy and discusses how this corruption process threw the masculine/feminine energies within each of us out of balance. A woman’s spiritual essence is, and always has been, power—the ability to access power from the depths of silence, to hold power within the body, and to wield power with the balance of the heart. A man’s spiritual essence is the embodiment of heart energy and the transcendence of the heart to merge with the void—that experience which is beyond the human spectrum. The first option is to buy the 2-DVD Set and pay for shipping. The second option is Pay-Per-View for $80 where you stream the video. To test the streaming quality on your computer, and be given the option to purchase afterward, click here. Click through photos taken at some of Lucia’s workshops in the United States, Canada, and Europe. Looking for books and movies about the 12 archetypes? Please visit our Resources page.